This card has been an incredibly long time coming. Jaya Ballard is one of the most popular characters from Magic’s early years – and she originally became so based only on flavor text. Just glancing through a pile of Ice Age cards will introduce you to her sharp-witted take on the quirks and perils of the eternal cold, and that’s before you get to the novels The Gathering Dark and The Shattered Alliance. In those, she plays a pivotal role in events leading up to Freyalise’s World Spell, which in turn paved the way for everything that happened after that. In a certain sense, Jaya Ballard is Magic’s history. As such, fans were hoping for a card depicting her for many years, but this was in the era before they invented a way to portray planeswalkers on cards. The closest we got was Jaya Ballard, Task Mage from Time Spiral. That card is pretty cool in itself – and it’s worth noting that its three abilities of different scales foreshadowed the way actual planeswalker cards would work – but there’s nothing quite like a representation of a planeswalker doing what they actually do. So what exactly is it that Jaya actually does? As one of Magic’s most iconic red characters, it’s perhaps fitting that she brings you some of Magic’s most iconic red abilities. The fast mana +1 can give you what is effectively a pretty crazy discount on her own cost, although you may feel bad the times you don’t have an instant or sorcery on hand. Similarly, her other +1 offers an excellent rate of digging through your deck and/or interacting with abilities like madness, especially over time when you didn’t have to devote mana to it beyond her additional cost. Having both on hand and both having +1 as their cost means that the chance of your being in a good position to use at least one is fairly high. The second one also feeds into her ultimate, which is one of the most powerful emblems I’ve seen recently – it makes your deck effectively twice as powerful, which is just the kind of push that burn decks need in multiplayer formats. Now, surely she is going to have some new quotes on Dominaria cards? It’d almost be crazy for her not to . . . This marks the second time Jaya Ballard has gotten a proper card, having received a creature in Time Spiral. She’s one of the archetypal “red” mages of Magic, and her first planeswalker is well in that vein: card filtering, mana acceleration, and a doozy of an ultimate. As always, though, five mana is that “dead zone” for planeswalker power, made even rougher by Jaya having triple red in her casting cost. The good news that way is that she has 5 loyalty, and both of her non-ultimates tick up her loyalty: three red mana to cast instants or sorceries, or lots of potential card filtering. Comboing Jaya on turn 5 with a three-mana burn spell is not a bad way to do things, truthfully, and she’s able to keep stoking the flames in subsequent turns. Card filtering is also a good place to be, since red can sometimes stall out; replacing extra Mountains with more spells is fair, and graveyard synergies can also be nifty (like Aftermath or Madness spells). 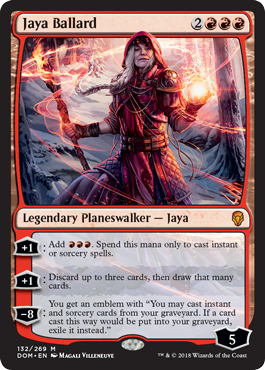 Jaya Ballard is in that interesting spot of being powerful, even for her mana cost, but maybe a bit awkward to make work exactly like you’d want to. I feel like she’ll have a home in Standard, with fringe Modern appearances here and there; that ultimate is too tempting to not try to make work, even if getting there can be a smidge laborious. She strikes me as solid all around, all the same.